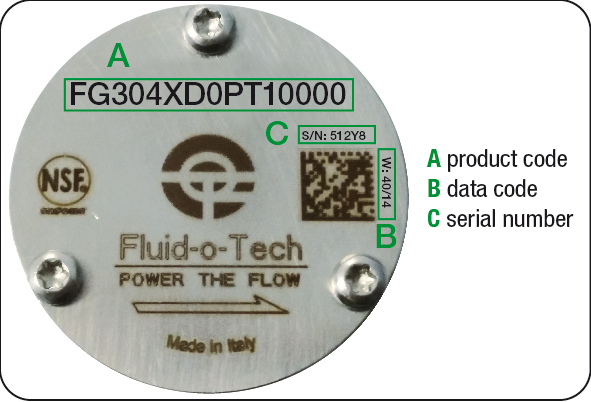 The Fluid-o-Tech FG200-300-400 series, born from the solid experience in mag drive gear pumps, is a smart and compact pump-motor unit. The pump housing is in stainless steel AISI 316L, while gears and bushings are in PEEK™ or PTFE™. Static seals in EPDM, NBR, PTFE™, Silicon or Viton guarantee full chemical compatibility with a wide range of fluids. Other materials, as well as a range of driving magnets are available. NSF certified pumps for potable water or fluids for human consumption are also available. In operation the FG series pumps are noiseless, pulsation-free and capable of handling liquids up to 95 °C (203 °F) with pressure up to 12 bar (175 psi) and flow rate up to 210 l/h (55 GPH). The integration of the pump with a rotor-less motor, where there are no moving parts, combined with the electromagnetic drive, gives birth to an exceptionally reliable, leak free, energy efficient unit. The integrated electronics allows the 24V brushless DC heart of the FG to respond to external signals making the unit ideal for integration into the most complex devices.